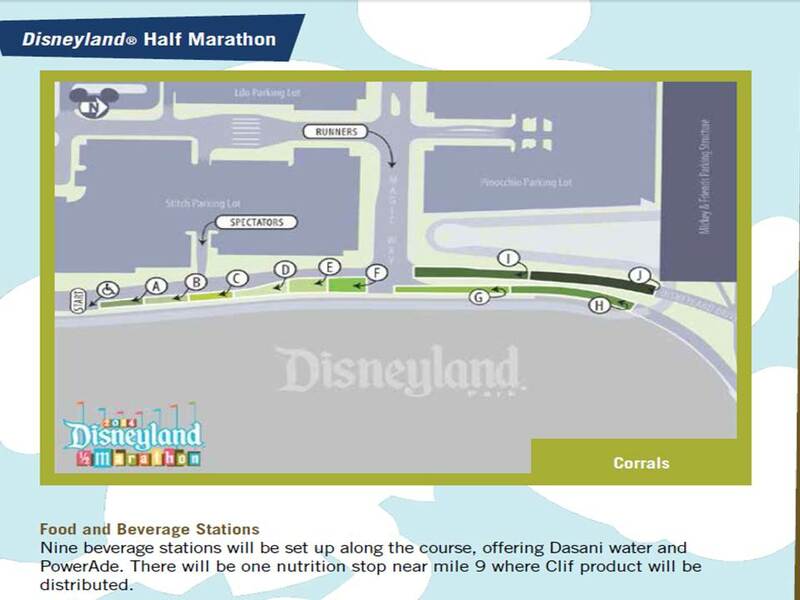 2014 Disneyland Half Marathon Guide is Now Available! IT’S HERE!!!!!!!!!!!!!! 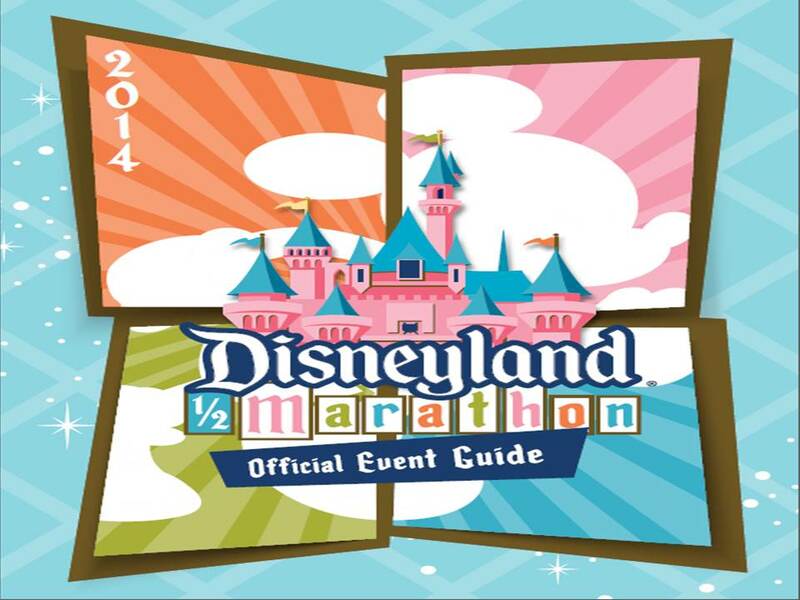 The 2014 Disneyland Half Marathon Official Event Guide is now available to be downloaded here. 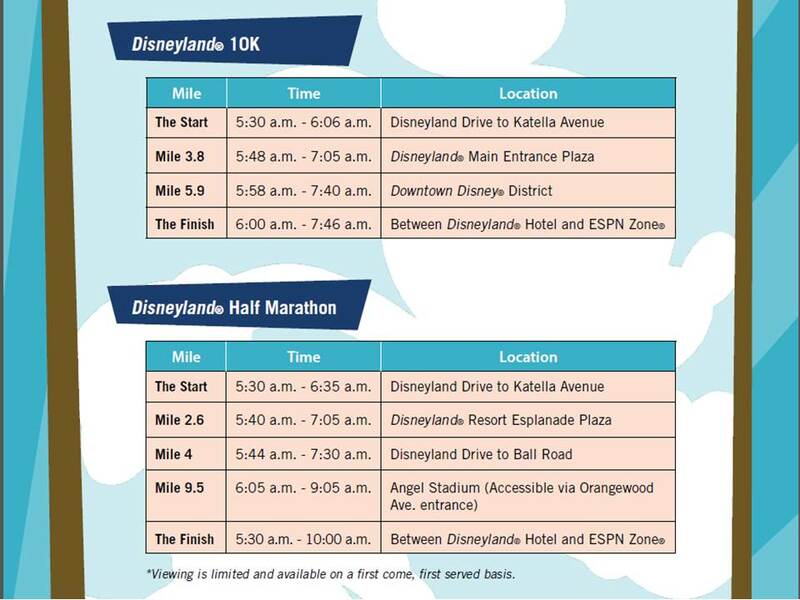 This guide is the place to read all the important information regarding the events happening during the Disneyland Half Marathon Weekend. 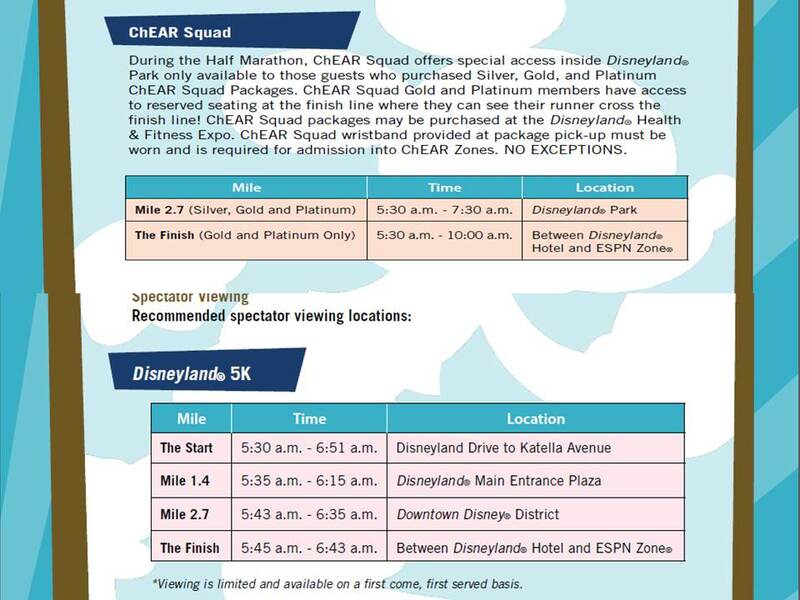 They will have these guides available at the Disneyland Half Marathon Expo. However, for those of you who are like myself and want to know the information as soon as possible, the folks at runDisney make this guide available for download before the races. So, click on the link above to find out ALL the information. In this blog post, I’d like to share some of the highlights with you all. So, let’s look inside. Shall we? 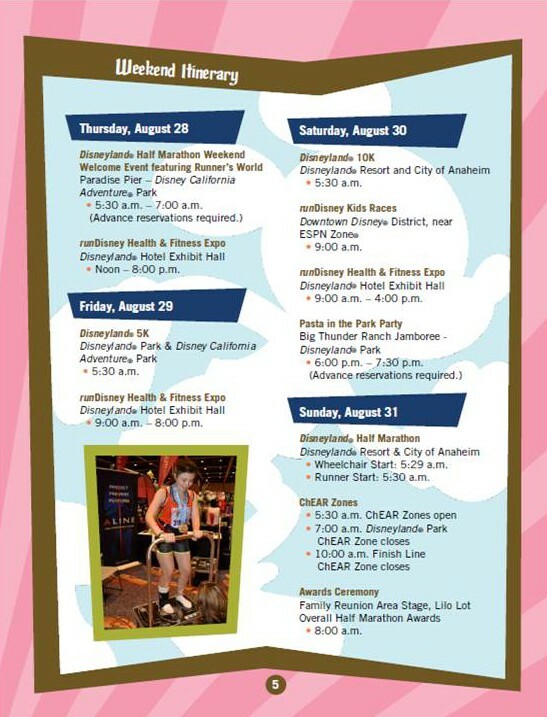 First off, on page 5 here is the itinerary for all the events going on as part of the 2014 Disneyland Half Marathon Weekend. In case the first event listed is not familiar with you, it’s a special event that I believe you had to pre-register for. They used to do meet-ups to kick off a lot of the runDisney events. Runners would stalk the runDisney twitter account waiting for the announcement of the meet-up and respond as quickly as possible for the very few spots for that event. It caused quite a frenzy on social media. Sadly, or maybe happily, those days are gone. So, if this Runner’s World Welcome Event is not something you recognize, you didn’t register for it. Another thing to take note of is this…the Expo opens at NOON on August 28th. Last year, it was insane. If you will be in town for the Expo, I highly recommend arriving at least 1 hour prior. I trust that runDisney learned from last year’s craziness at the Expo and will manage the event better this year. However, it’s better to be safe than sorry. You can read about my experience last year here. About a week to two weeks prior to the Expo, be on the lookout for teaser pictures of some of the official race merchandise. If you really want something, you will want to be at the Expo early on day 1 or risk not having that item in stock. 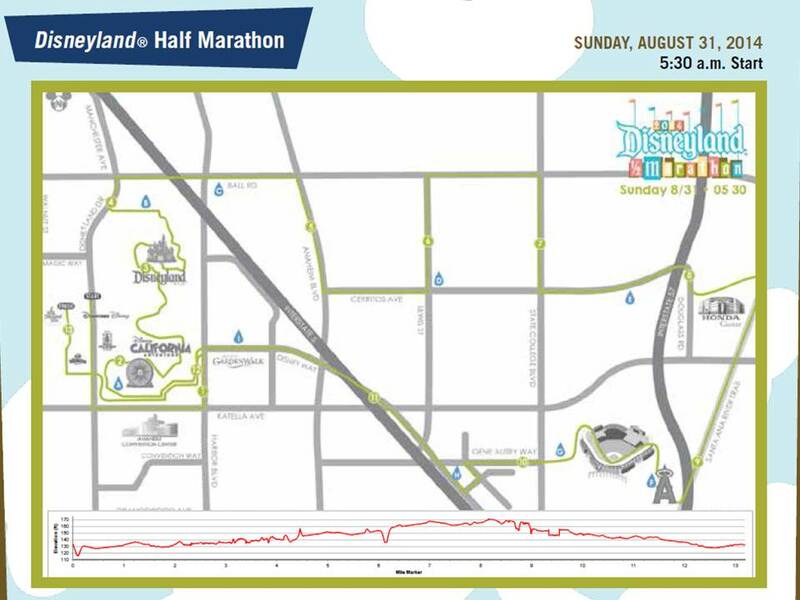 Here is the official 2014 Disneyland Half Marathon course map. I’m really stoked to see that we will indeed be running through Angel Stadium again this year! With the Angels having a home game that starts at 12:35pm, there were rumblings earlier this year that we might not be running through the stadium. So, I’m really happy to find that we will get to run through the stadium. Honestly, as much as I like running through the theme parks, the part of the course around Angel Stadium was the absolute highlight from last year for me. On August 3rd, I will be reprising my Disneyland Half Marathon Dress Rehearsal from last year. If anyone is interested in joining me for the 12.5 miles of training on the Jeff Galloway plan, let me know. However, I mention this because I am planning a very detailed series of blogs about the Disneyland Half Marathon course in the week after that. If you want to know the race course inside and out, make sure to check out those posts in the very first week of August. 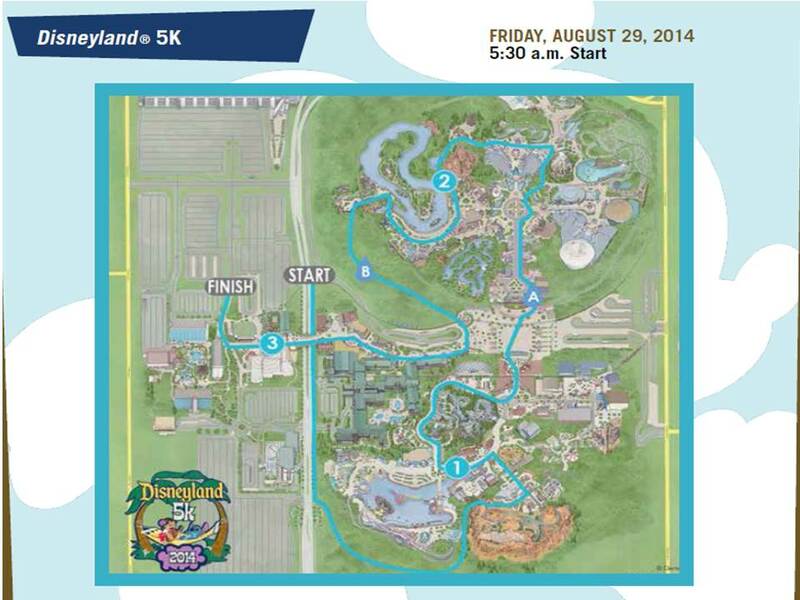 For now, here is the map from runDisney. Another fun part of the guide is that they give you the map of the starting corrals and where they will be lining up come race morning. It looks like there were corrals A-J this year. That would make 3 more corrals than last year. In the image above, I’ve also included the part that talks about the fuel stations on the course. Note, that PowerAde will be the beverage offered other than water. Also, they will have Cliff Shots near mile 9. The cliff shots come right after you enter the parking lot at the Big A. If you are not a Cliff Shots lover, be sure to bring your own fuel that you’ve tried out on your training runs before hand. If you’ve never tried Cliff Shots, go to your local running store or go to Amazon and buy some to try out. Experimenting on race day is not encouraged. 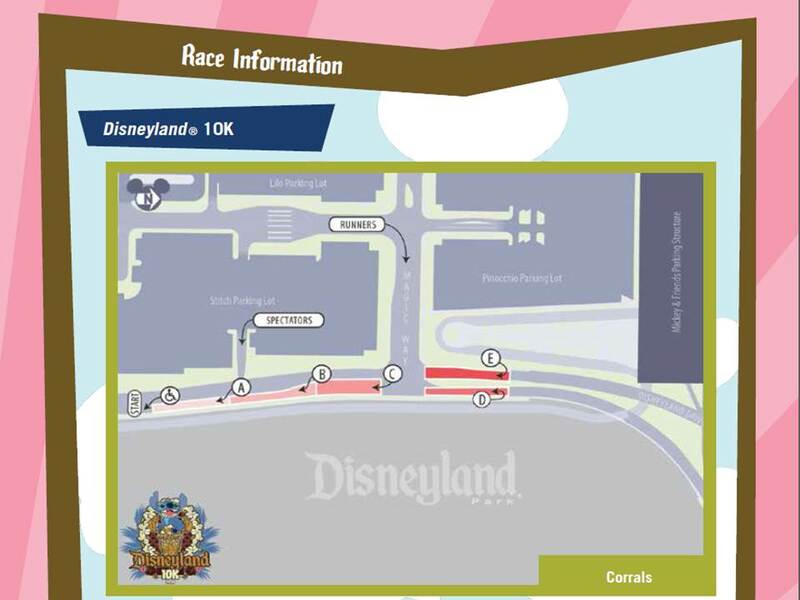 Here is the Disneyland 10K course map! It’s the same route as last year! I absolutely loved running the Disneyland 10K last year. 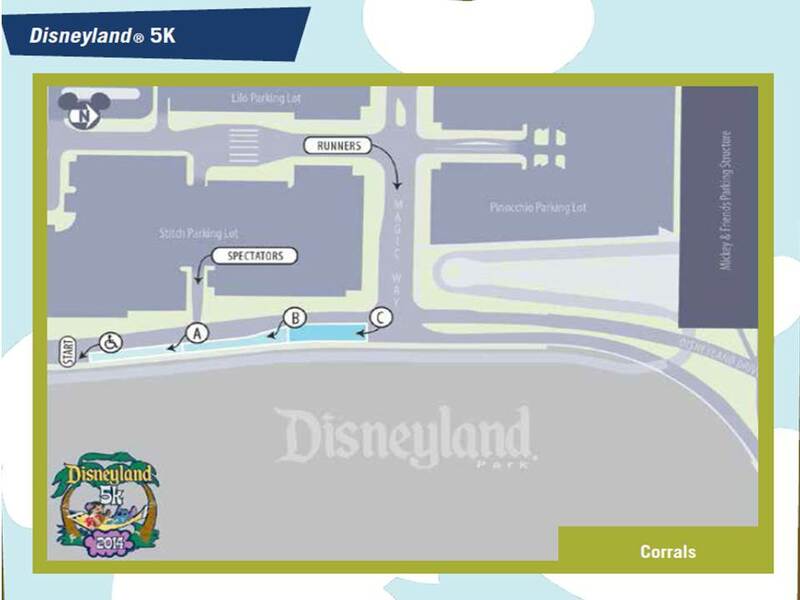 Here are the corral locations for the Disneyland 10K race. One thing I can’t help but wonder as I look at this is how the seeding of the Dumbo Double Dare participants will go. After all, the Disneyland Half Marathon has corrals A-J. The Disneyland 10K has corrals A-E. 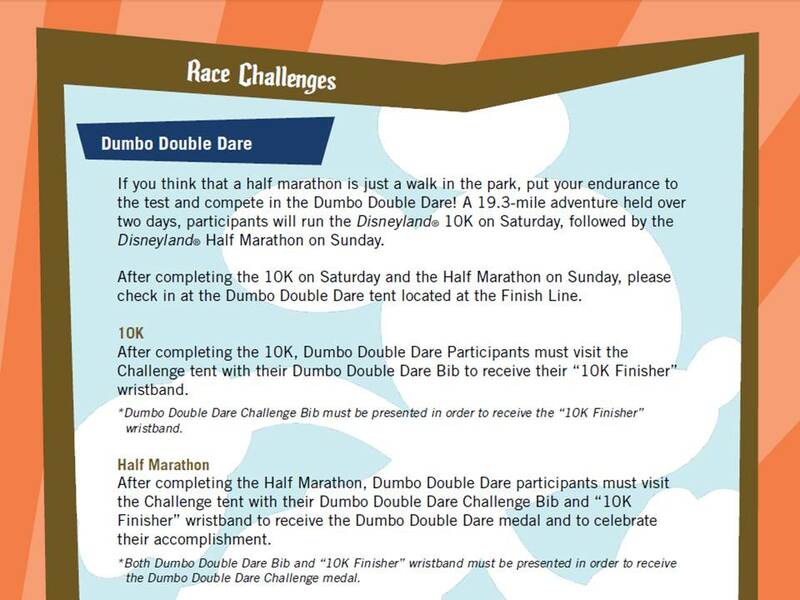 So, I wonder if the Dumbo Double Dare participants will be seeded no further back than corral E. If so, then the Dumbo Double Dare participants will have a nice cushion of time for the half. 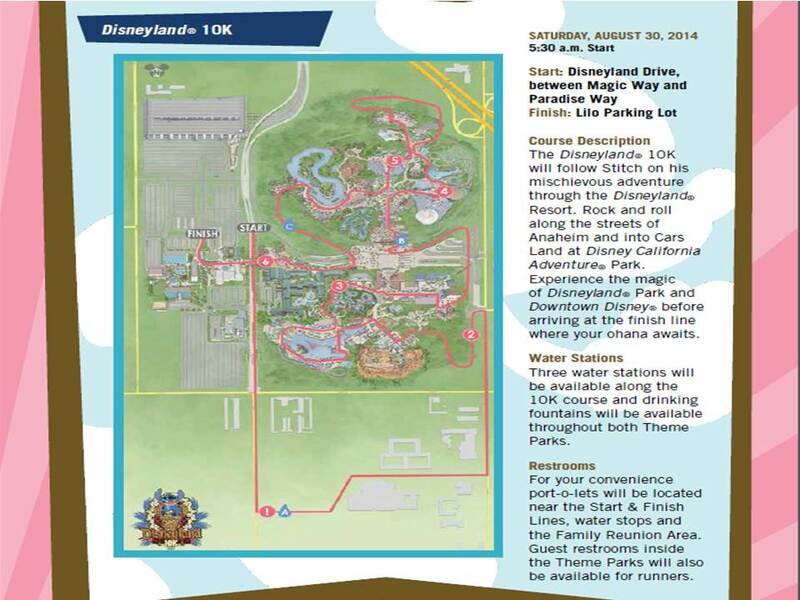 The last map is of the Disneyland 5K course. Even though I won’t be running this route, it looks fun! Here is the corral line up for the Disneyland 5K race. As you can see, there are only 3 corrals. 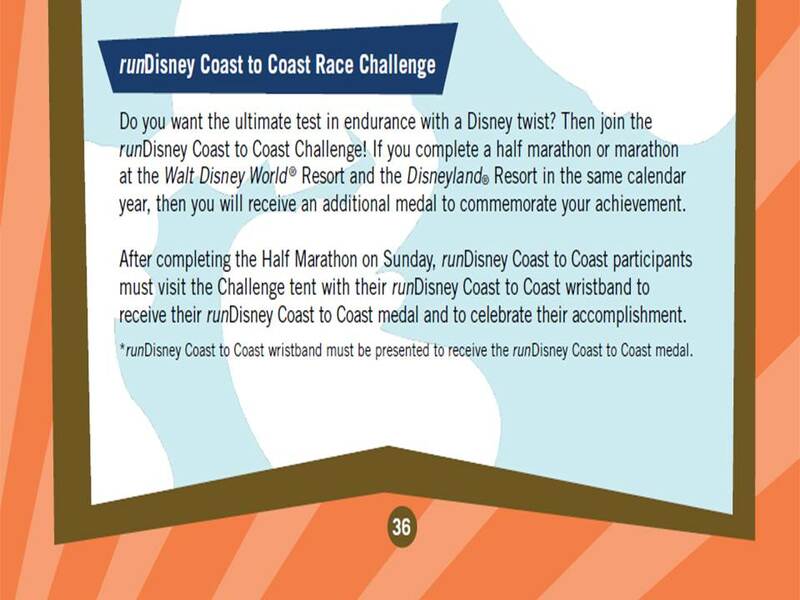 If you are completing the Dumbo Double Dare challenge or racing the Disneyland Half Marathon to complete the Coast to Coast Challenge (or both) these two images and page 36 of the guide is very important. After all, you’ve done the training and finished the races. So, you will want to make sure you get the proper bling at the end. Right? 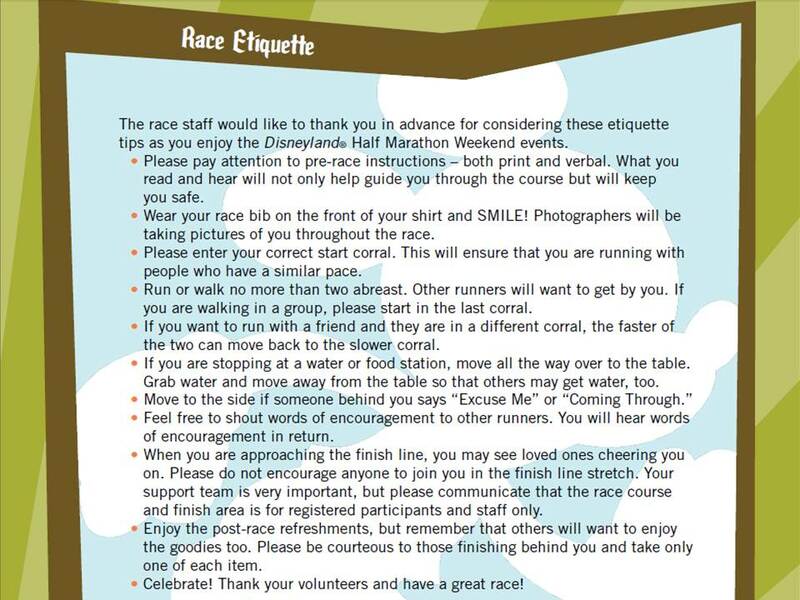 Here is a page that I’m sure most runners running in the races will never read. However, if you are a reader of this blog, you now have no excuse about knowing runner etiquette. As you run in the races, you will probably see people breaking the rules all over the place. Just because they break the rules doesn’t mean you have to join them. Let’s be the runners who lead the way in demonstrating proper running etiquette. 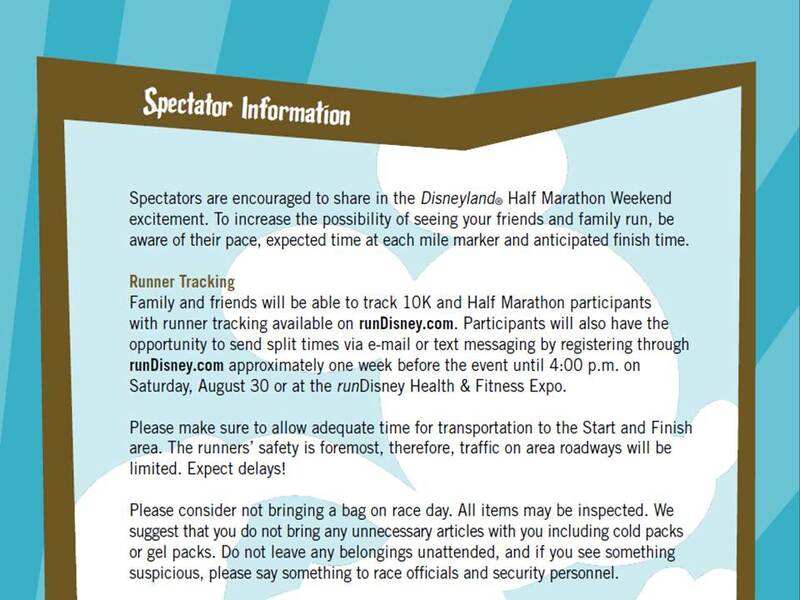 This applies not only to the Disneyland Half Marathon races, but ALL races that you run in. One rule that is missing from this list… if you’re a run/walk/runner like myself, look around you and raise your hand to indicate to others that you are starting a walk break. If you notice that someone is charging up right by you, try to get out of their way. We raise our hand to let others around us know that we are about to walk. This way, the runners behind you can adjust safely. The last part I wish to highlight is about spectator information. This slide has some good information for those who have come to watch you run. Do you have friends and family back home that want to follow along? You might want to give them this information. Also, runner tracking would be a good thing for those who are there to watch you run as well. After all, who wants to sit out for 2 hours waiting for you to come by when they can wait for a half hour or so instead? If you’re a regular at the Walt Disney World runDisney events, the top part of this graphic is something you should remember. At Walt Disney World, you can get into the Magic Kingdom for the half marathons and marathon without being a chEAR Squad member for free. At Disneyland, this is not the case. So, if you want your friend and/or relative to watch you run up Main Street U.S.A. at Disneyland, they need to be a chEAR Squat member in the categories listed to be there. Please make sure to let your supporters know this BEFORE the race. They will be highly disappointed when they arrive and find they cannot get in. If you look above, even though your supporters who are not chEAR Squad members cannot watch you run up Main Street U.S.A., they can watch you run in between Disney California Adventure and Disneyland in the Esplanade Plaza. Last year, there was a big crowd of supporters in between the parks. Are you ready to get your medal(s)? 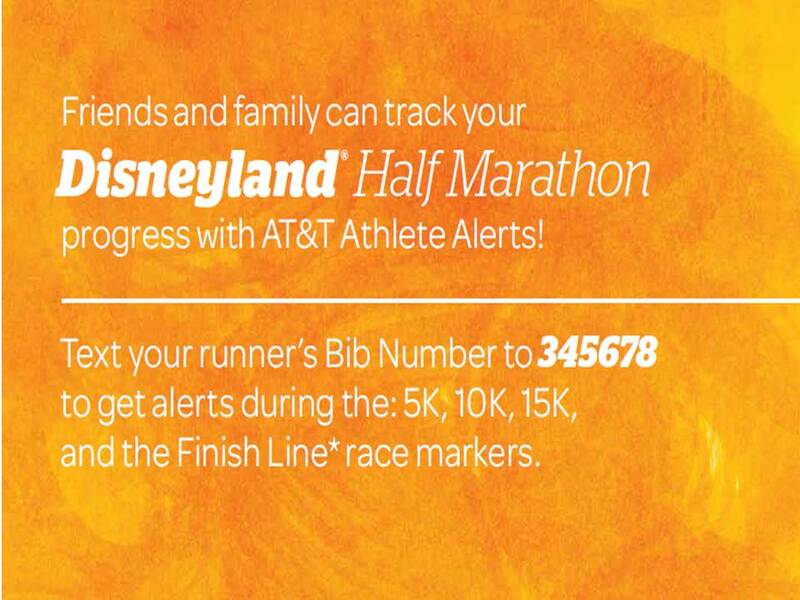 With the 2014 Disneyland Half Marathon Official Guide now available, it won’t be long before we get that email from runDisney with the link to print our race waivers and get to see the corral placements! 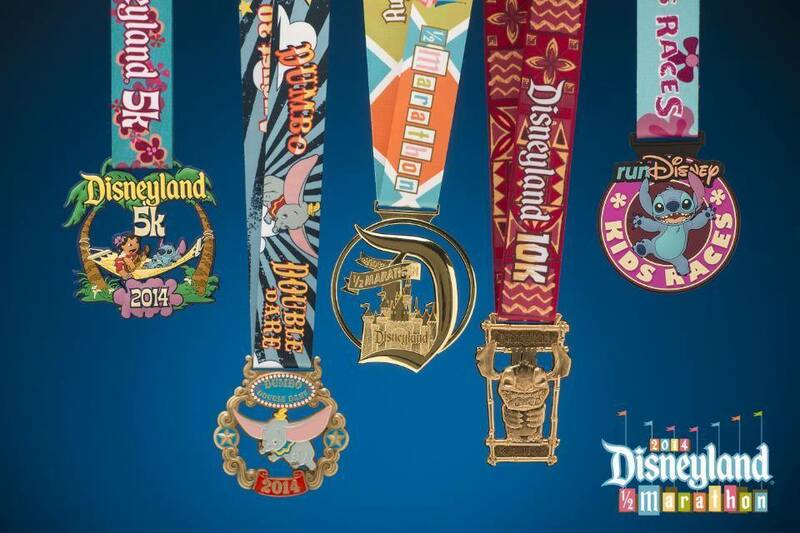 The 2014 Disneyland Half Marathon Weekend will be here before we know it! I can’t wait! Be sure to read through the entire guide if you have the time. I’ve only included some of what you will find inside the guide. So, check it out! You bring up a good point. I didn’t see that either. Since this is the first time I qualify for the Coast to Coast, I’m not sure. The Expo is divided on two floors. The bottom floor is where you get your race bib and turn in your waiver. The top floor is where the vendors, runDisney official merch, and race packets are. As you enter on the top floor, there is a desk that is staffed by runDisney people who might be able to answer your question. So, I would say to stop by the desk before you go into the exhibit hall for your race shirt. That’s what I’m planning on doing. After all, I want that Coast to Coast medal. No worries about running on August 3rd with me around the parts of the Disneyland Half Marathon course that I can get into. LOL! I hope your wife has a wonderful birthday! Yay for August birthdays! Well since you are going on Thursday and I am going on Friday you can enlighten me before I get there! Yay! Absolutely! I’ll check it out on Thursday and let you know. Can’t believe it’s almost time for the Disneyland Half again! Seems like this past year has flown by!! I can’t believe it either. It’s so close, yet so far away. 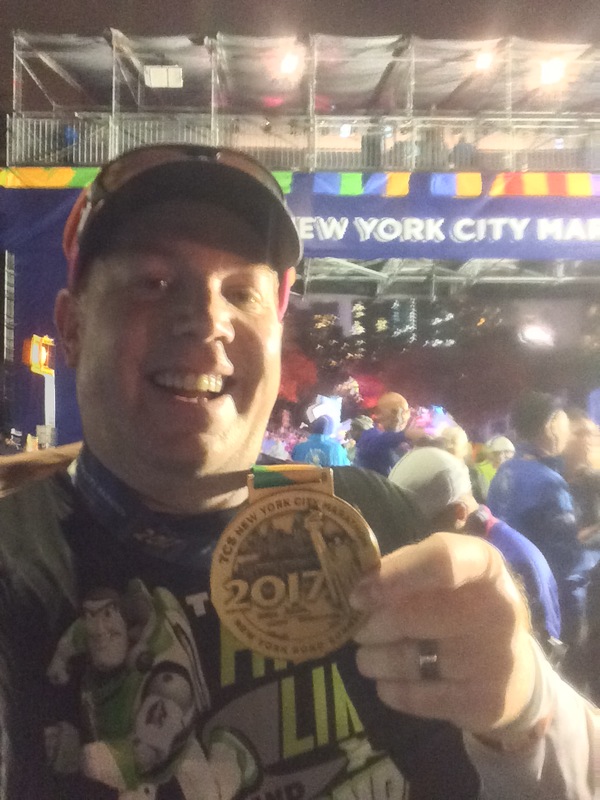 With Avengers and Star Wars Half Marathons added to the runDisney Disneyland calendar, I’m not sure how much I will run the Disneyland Half in the future. However, I’m totally looking forward to getting the Dumbo Double Dare medal this year and my first Coast to Coast medal! Too bad you and your husband won’t be out here this year.